There’s no debating it. If you’re looking to grab the attention of your visitors, you need captivating visuals. Visuals instantly catch the eye, are shared more often, and enhance the overall impact of your post. Creating visuals may seem daunting if you don’t have a professional background in design. Luckily, we live in an age where there’s an app for everything: Pizza, taxis, and yes, visuals! This post covers, in detail, the best tools for creating visuals that people will love and share! Screenpresso is dedicated to image and video screen capture. It’s fun to use and packed with features. – Capture a screenshot while scrolling down or horizontally across a window. This feature is great for capturing content such as newsletters and maps. You can, of course, capture parts of a screen or the whole screen as well. – Edit your screenshot. You can add shapes (such as arrows, a magnifying glass, braces, and numbers), annotations, and also blur parts of your screenshot. – Capture a video from your screen. This is ideal for making short tutorials and can be converted into a file less than 1MB. It is also possible to convert videos into a format of your choice and extract images from them. – Generate documents such as PDF, Word, or HTML, using a series of images captured. This is a cool feature if you want to convert your screen captures into a quick, downloadable guide. – Share or publish your capture instantly via social media, email, and cloud sharing. It takes a while to get around Screenpresso the first time you use it. The Scrolling Window Screen capture is especially tricky. However, the team has a helpful YouTube tutorial for reference. Once you start using the tool, you will get used to it. While you might find many features unavailable in the free version, the tool is still good enough if you’re looking for high-quality screenshots and the ability to edit them. Screenpresso Free: Major limitations including limited Image Editor, limited Document Generator, and Screenpresso branding on all videos and shared content. 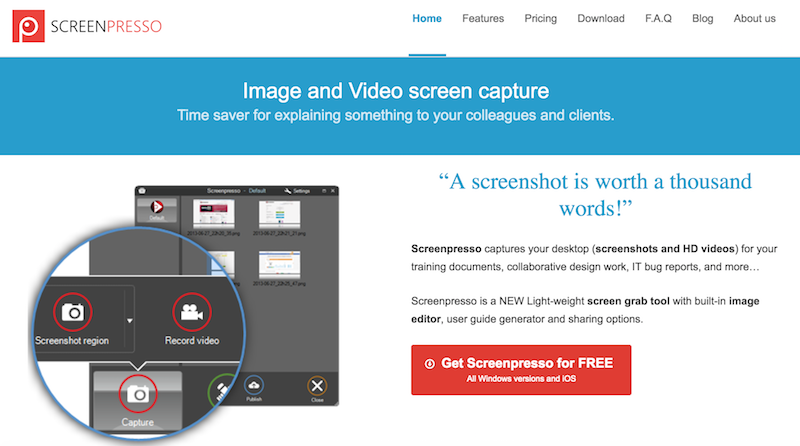 Screenpresso Pro: 28.89 euros per user; for freelancers and small teams. Site License: 1890 euros; for companies. 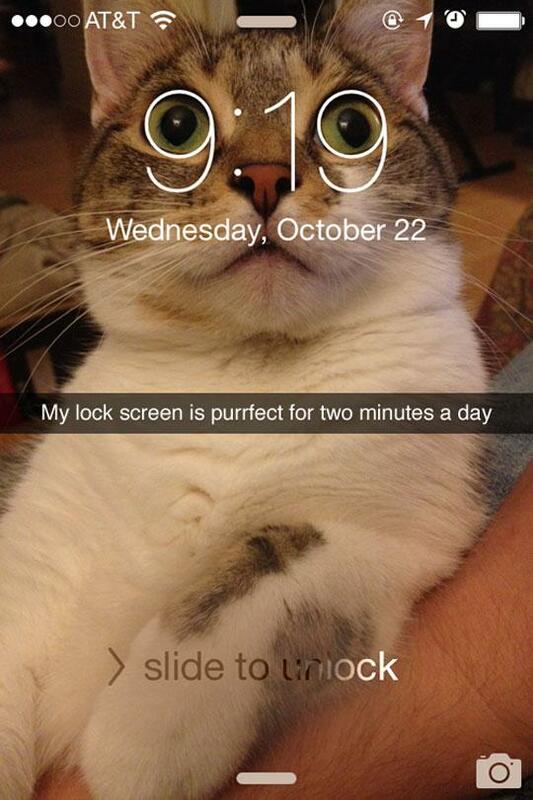 Awesome Screenshot is available as a Chrome extension. It is used to capture web pages, partly, or wholly. – Add text, shapes, and annotations to your captures, as well as blur parts of your image. You can also upload images from your computer to annotate. – Collaborate easily with your team, with the ability to add comments that are shared directly on the image. 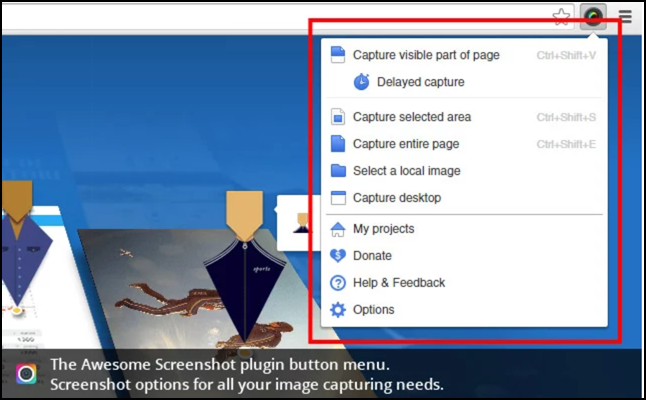 – Capture features such as drop-down menus with the presence of delayed screen capture. Awesome Screenshot is fairly easy to use; even the full-page captures are pretty straightforward. However, the quality of full-page captures is not the best you can get. Free plan: For 30 images. Premium plan: $8.99 a year (for the next 1000-3000 users who upgrade) with unlimited images. While not only a tool for screenshots, Placeit takes the concept of screenshots to another level by allowing you to “place” your desired screenshot into a phone or computer. Easily generate a mock-up of your app or website within minutes! – Enter a desired URL into the app to grab images (such as the homepage of your website). You can also upload a screenshot from your PC. – Choose a transparent background that you can later edit in Photoshop, or select from one of their given background categories such as business, adults, children, eating out, etc. – One of the coolest features of the app is that it has the ability to add videos in your mock-up. All you have to do is record your screen (using a third party app that Placeit recommends). You can then place it in a pre-designed mock-up. To capture a scrolling web page, you simply have to enter a URL and they will automatically capture it for you. – Available devices that you can create mock-ups in include iPhones, MacBooks, Kindles, and various other desktops and browsers. Placeit is fairly easy to use, although the image editing features are not that powerful. At best, you can add text and some basic effects. Some of the mock-ups are only available for download if you pay. Paid one time purchases: $8 and $28 per image, for high and super-high quality respectively. $99 for a high-resolution video. Subscription plans: From $29/month and $99/month for images. $199 per month for images and videos. All these plans have a limited number of downloads per month. 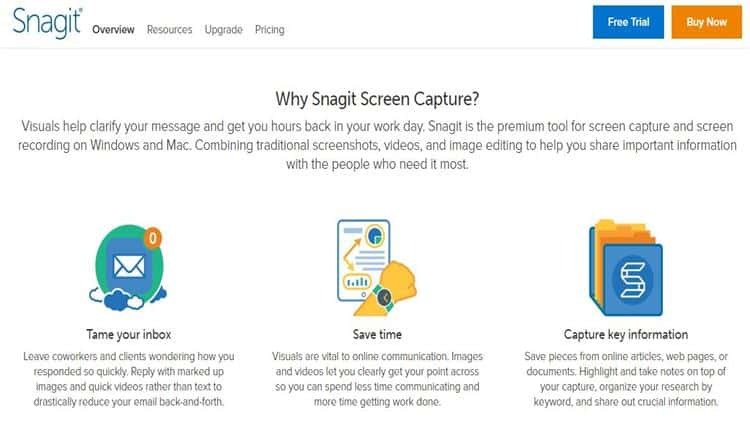 Snagit is an image and video capture tool. It also allows you to capture scrolling windows and create GIFs. – Edit screenshots with the various editing options available such as adding callouts, shapes, showing steps in an image, special stamps, borders, symbols, and magnifying and blurring parts of an image. – Its “Scrolling Windows Capture” is high-quality and one of its distinguishing features. Scrolling images can be captured in any direction and the resulting images look great. – Videos can be edited in Snagit itself such as trimming and adding sounds. You can also record videos via your webcam using Snagit. Though it’s packed with features, Snagit has a user-friendly interface. It is easy to get around and fun to meddle with. Free trial: Lasts 15 days. Paid plan: $49.95 for a single user. Volume pricing available if you are buying more than 5 subscriptions. – Along with infographics, you can also use Canva to make other visuals such as menus, flyers, magazine covers, collages, and social media graphics using their pre-designed templates. – Infographics are divided into four helpful subcategories: Business, Charity, Education, and Timeline. – Edit your chosen template by changing its text, background, adding images, icons, additional text, shapes, lines, charts, graphs, and even hyperlinks! You might start with a template, but you will end up with your own unique infographic in a matter of minutes. Canva is such a breeze to use! You will find yourself spending a great deal of time on it, not wanting to move on to your next task. It has a myriad of editing features that are all quick and easy to use for beginners. Free: Great for basic use; many features are available in this version. Canva for Work: $9.95 per month paid annually; $12.95 per month paid monthly. Venngage is a graphic design tool for infographics, reports, social media, posters, and promotions. – The categories of infographics include Statistical, Informational, Process, Comparison, Timeline, Geographic, Charts, and Tutorial. – Add an exhaustive number of add-ons to your infographics such as data-driven charts, maps, text, images, hyperlinks, and a whole lot of icons ranging from currencies and food to gaming, healthcare, data, and mining. The number of add-ons is pretty mind-boggling! – One of the coolest features of Venngage is the ability to add interactive elements such as forms, polls, and YouTube videos to your infographics. 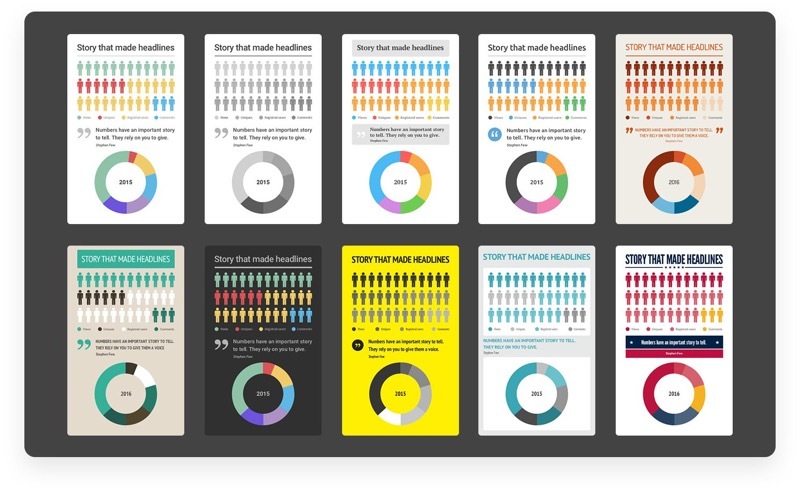 It’s a great way to take your infographic to the next level! The drag and drop features make Venngage easy to use. The interface is user-friendly too, with an easy to edit toolbar on the top. A lot of the templates are marked as premium (meaning you will need to upgrade to use them). There are a good number of free templates available, though. 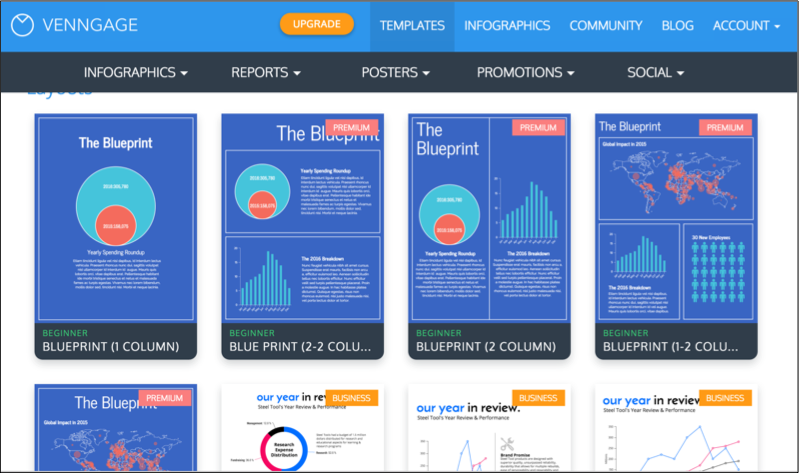 Free: Limited number of themes, templates, charts, and infographics. Also under this plan, you can only make five infographics… with Venngage branding. Quarterly and yearly plans at discounted rates. Easel.ly is an infographic tool used by institutions like Harvard, Stanford, and the University of California, and companies like IBM, Boeing, and Whole Foods. – Choose infographics by category or theme. Available categories include Entertainment, Animals, and History. Themes include Resumes, Timeline, Comparison, and so on. 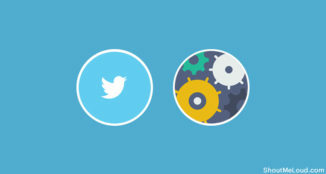 – Add shapes, texts, charts, hyperlinks, stock photos, and YouTube videos to your infographic. – There are subcategories for objects, such as flags, banners, animals, and so on. You can get more options by going Pro. While easy to use, a number of Easel.ly templates are text-heavy. You will spend a considerable amount of time getting the template to look the way you want. If you’re looking for a tool that doesn’t rely too much on your own sense of design and simply lets you replace text and images in a template, you might find this a little inconvenient to use. A good number of templates on their homepage are familiar. Free templates and features are limited and most need you to go Pro. Pro: $3 per month, with lots of free images, templates, and fonts. 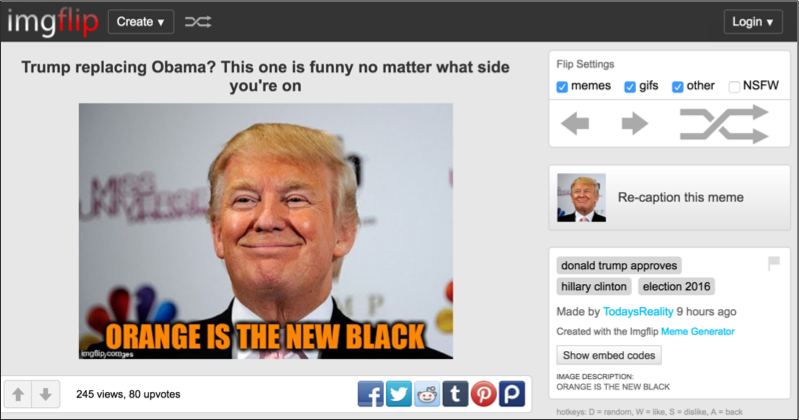 Quickmeme is the most basic meme generator you’ll find! Caution: Only visit the website if you have tons of time; it’s pretty addictive! – Create a basic meme by selecting one of the already available templates. Many popular memes are available for use. You can add your own text to the meme, and voila, you’re done! – You’ll find your most popular memes here such as Pickup Line Scientist (Howard Wolowitz from The Big Bang Theory), Drunk Baby, Forever Alone, and Success Kid. Quickmeme requires you to log in with Facebook. You can browse through the thousands of publicly shared memes on their site, or create one of your own. The final meme has their branding and can be downloaded. 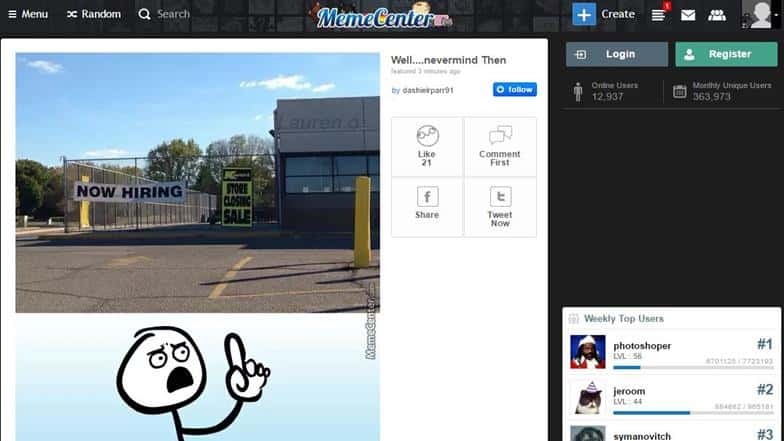 Meme Center is more like a social meme site. You can share your own memes, like other memes, create your own, and comment. It provides the following tools: Memebuilder, Quick Meme Maker, and Gifmaker. – Make your own meme using Memebuilder, or choose from the Quick Meme option that provides you with preset images. – The categories include popular faces such as Grumpy Cat, Harry Potter, and also Valentines. 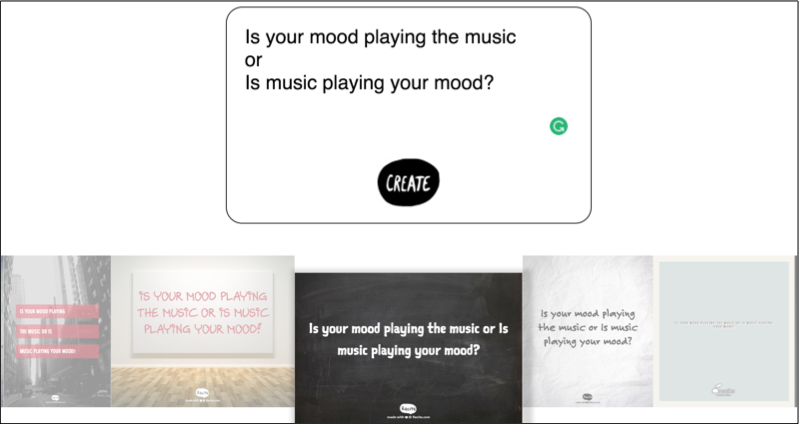 – Choose your desired meme, add your own captions, and select your font and alignment. Meme Center is fairly easy to navigate. It offers a lot of flexibility with font size, captions, and alignment. Building a meme from scratch can be scary, so their Quick Meme option helps. The final meme can either be posted to Meme Center, or saved to your own computer. 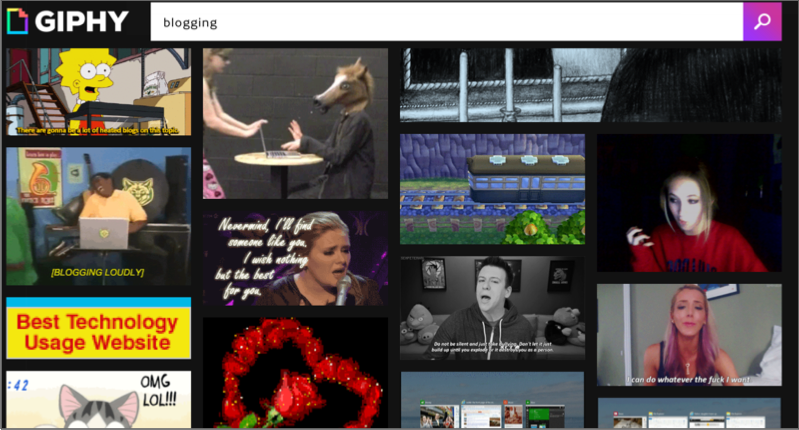 Giphy is a search engine that allows you to discover and share the best GIFs on the internet. It also allows you create your own GIFs using their editor. – The GIF Maker allows you to create your own GIF from YouTube and Vimeo videos. All you have to do is enter a video link, and choose start and end times in Giphy. And there you have your own GIF! – The GIF Caption allows you to caption a ready-made GIF from Giphy’s huge database. You can also add your own images or GIFs, and simply add your own caption to them. Add captions, stickers, or even animated stickers to your GIFs in this editor. It’s a great option for beginners. – The Slideshow option lets you create an animated GIF slideshow, with images or a series of GIFs. – For advanced editing, the GIF Editor has a wider range of stickers and choices. Giphy is fun and easy to use, and if you don’t know where to begin, they have helpful tutorials for guidance. Once you’re done, you can choose to keep it private or share it with the Giphy community. Imgflip lets you make a GIF from videos or images, or using GIF templates on the site. – Create a GIF with one of their preset GIFs, images, or use a video from YouTube. – There’s also an option to make memes and pie charts on the site, which is fairly easy. At first, Imgflip might seem daunting, but you’ll get used to it. It is easy to make a GIF using templates and YouTube videos once you get the hang of it. Imgflip Free: Does not let you preview your GIF while editing (if you’re not using a YouTube video). Imgflip Pro: $9.95 per month with a lot of unlimited features. LICEcap allows you to create GIFs from your own desktop! Let’s say you don’t want a funny GIF, but an informational one such as showing how to save a file. Basically, for micro actions where a video would be too long, and text-only would not suffice, that’s where LICEcap comes in. – Capture any part of your screen. Increase and decrease the size of the recording space and toggle back and forth with ease. – You can also pause for a while and capture a different part of the screen. – Automatically stop recording when you’re done! Having a single powerful feature, LICEcap is quick and easy to use. Infogr.am is a tool for making charts and graphs. The tool features samples from The Verge, HuffPost Business, and Nerd Wallet. You can see exactly what the app has been used to create. – There are more than 35 types of charts and 200 maps to choose from when making your own. – Add your own data from Google Docs, Excel Sheets, or CSV. It also allows you to choose data from public records of the World Bank, UN, and other sources. All of this from the tool itself! 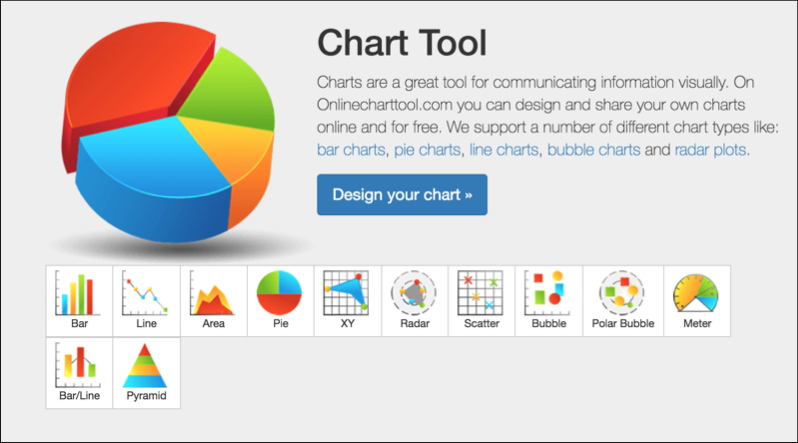 – Create interactive charts. These allow readers to switch data sets and play with it themselves! – Create animated GIFs from your charts and graphs to make them even more appealing. If you’re not very comfortable working with Excel sheets, you will find Infogr.am intimidating, but such is the nature of the beast you are trying to create. For someone who has a working knowledge of Excel sheets, however, the tool should be easy to use. Free Plan: Images cannot be download in .png format. Pro Plan: $19 per month. Business Plan: $67 per month. Enterprise Plan: Available on request. One of the more straightforward chart makers out there, Online Chart Tool allows you to create various types of charts and graphs such as Bar, Line, Area, Pie, Bubble, Pyramid, etc. – Choose the type of chart you wish to create. Enter data manually or import a CSV file (the latter option is easier). – The tool has some detailed editing features that feel like a boon… once you figure out how to use them! If all you’re looking to make is a simple bar chart, then Online Chart Tool is great. You have to edit the charts without seeing a preview. Naturally, for more complicated charts, this tool is a bit difficult to navigate. “Legend” is the chart’s key, by the way, in case you’re not familiar with chart jargon. A few times back and forth, and you should be able to make a decent chart! 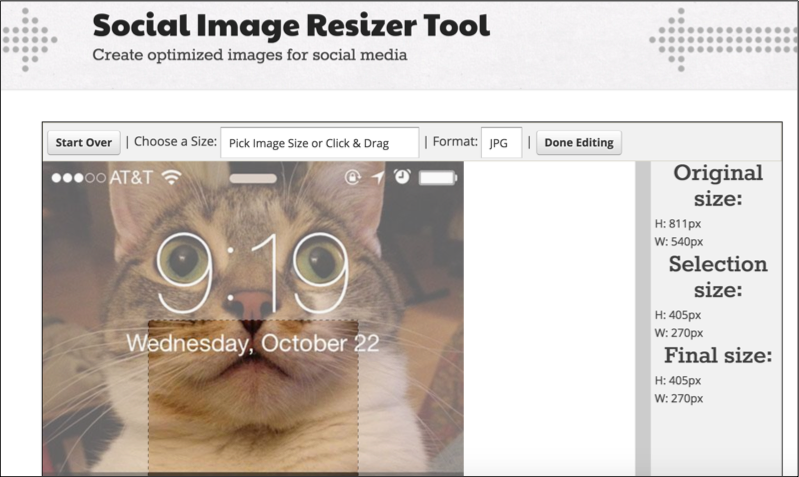 Social Image Resizer Tool allows you to crop images to the optimal size for social networks. – Choose from a wide range of social networks to crop for such as Facebook, Twitter, LinkedIn, Instagram, YouTube, and Pinterest. – Within these social networks, there is a wide range of purposes you can choose to crop the image for such as cover art, profile photo, thumbnail, highlight image, headers, etc. The sizes vary for each social network. 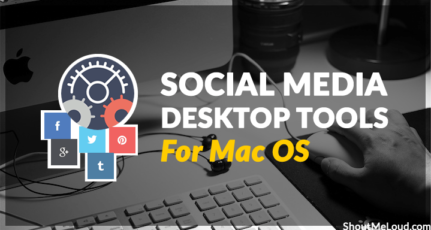 Social Image Resizer Tool is a breeze to use. Simply select an image that you want to resize, select the social network, and that’s it! The final image can be downloaded to your computer. Unlike many image resizers out there, this one has a pop-up free page and is easy on the eyes! Landscape is a simple image resizer for social networks or otherwise. 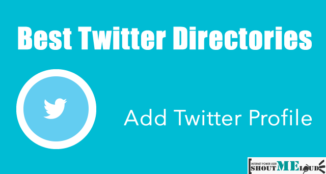 – Select from a wide range of social networks including Twitter, Facebook, Google, Instagram, LinkedIn, YouTube, and Pinterest. – For each social network, there is a wide range of sizes available. These are also sorted by your purpose such as cover photo, post, etc. You can also add a size of your own choice. 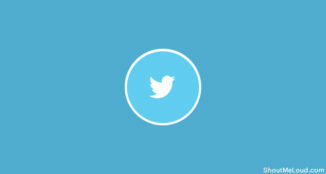 – Crop for various social networks at once and download all of them together! Landscape has a great interface and is user-friendly. 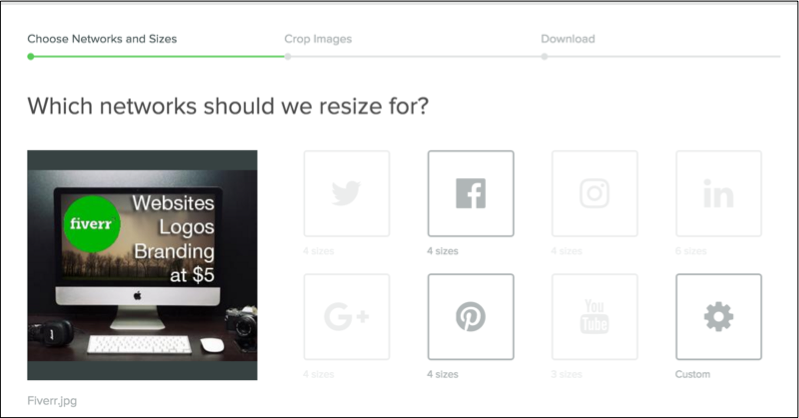 Manually select social networks to crop for, or enter a custom size. There’s also the option to auto-crop for all possible social networks. Once you’re done, download all images into one Zip file. Word Swag is an app for Android and iOS that allows you to put text over pictures. – Put text over your own images, or select from the free backgrounds available. Add your own text with ease. If you’re not sure what to say, then choose from the various captions and quotes available. – There are 48 text styles available and you can also create custom text layouts. – The tool is especially helpful for blog graphics such cover photos for your post. They have helpful categories such as Food, Travel, etc. Word Swag makes it easy to create images with text. It has over 590,000 backgrounds as well as many editing features. Just pick a design you like and get started! The completed picture can be saved or shared to social networks. Paid: $4.99 on iOS, $3.99 on Android. AddText lets you put text over images, either your own or selected from their database. – Add photos of your own or select from a wide range of image categories. These include Abstract, Memes, Animals, People, Nature, and “Cute”. – You can add more text, and also resize and move it as you desire. – Another cool feature is that the tool lets you select text styles like: Funny, Romantic, and Meme-style. AddText is perfect for creating a range of images with quotes or captions in less than a few minutes. It’s that easy to use! 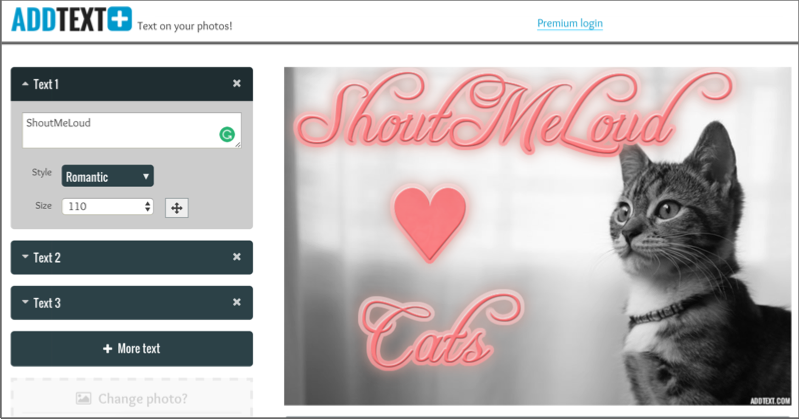 QuotesCover is a tool for adding quotes on images and sharing for social media. Make your quotes more shareable in a simple and quick way! – Select a quote from the various categories available such as Romance, Life, Youth, etc. You can also add one of your own quotes (such as tweetable snippets from your blog post). 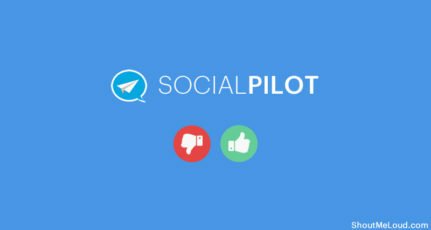 – Choose the social network you want to use it for as well as the purpose (lots of options including Facebook covers, updates, Twitter header, Google cover, etc.). You can also download the image for printing, or as a wallpaper for your own desktop. – Edit your image using different fonts and background colors (or images from your computer). QuotesCover is super easy to use, helpfully guiding you at every step. The selection of fonts and colors for your text can be a bit tedious. They show up one by one, as opposed to being available in one drop-down menu. As soon as you’re done making your image, simply download a .png or .jpg. Recite is as simple as a quote-over-images tool can possibly get! – Enter a quote or choose one from their various categories including Art, Age, Beauty, Wisdom, Dreams, Peace, Leadership, and much more. – Paste your quote onto one of the several pre-designed backgrounds. With its hassle-free interface and straightforward premise, Recite is your go-to tool if you want to make a quick batch of images with quotes. Completed images can be directly shared to social media or downloaded. Sometimes, of course, you want to use ready-made visuals instead of spending any time on making visuals (even with the ease that the tools given above provide). Well, we’ve got you covered there as well! Unsplash offers a range of high-quality photos, which are licensed under Creative Commons Zero. This means you can use the photos for free, even for commercial purposes without asking permission from or providing attribution to the photographer or Unsplash. Even crediting them is not necessary, though of course, it’s always appreciated! The tool makes it easy to search its vast database with its collections. You can find pictures you’re looking for by entering your topic. The images have a high resolution and can be downloaded with a click. They also have a “Made with Unsplash” page. Here, you can see all the things that have used Unsplash images such as articles, websites, and apps. Available collections include Monotone, Gourmet, Weddings, Travel, City Life, and so on. Unsplash images are also available in other apps such as Over, Buffer, and InVision. Startup Stock Photos provides free photos for bloggers, startups, designers, developers, and websites. It is simple and easy-to-use. As soon as you open it, you’re greeted with photos of people working on a laptop, going over a presentation, bouncing ideas in a meeting, and so on. This cool project helps bloggers and brands find high-quality images for commercial use. Today, it also funds photographers in their community to produce more awesome work. They also send prompts to writers. The premise is simple. You can sign up for free and receive a new photo pack each month by email. These photos can be used anywhere, including social media, blogs, and mock-ups. What’s interesting is Death to the Stock Photo is not merely an email newsletter for free photos. Each email contains a new photo pack, along with the story behind it. So far, I’ve received a photo pack about living in the wild and one about training as an athlete. It was actually shot on the same track that British Olympians train on! There are two paid plans to choose from, Basic and Premium. The former is $15 per month while the latter is $180 per year. Each of these plans provides new photo packs each week. The Basic plan comes pre-loaded with 95 photo packs. With Premium, you can explore their whole library of photos shot to date! The quality of photos is so good that you’ll want to sign up merely for the joy of seeing them every month. No wonder companies like Pinterest and Visa have signed up! Using images and visuals on a website/blog is so essential for creating a great user experience. And with these tools, it’s easy to add in some visual flair. 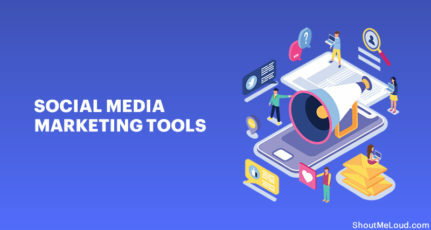 We hope these tools have provided you with inspiration to create your own visual content to keep your audience engaged. Do share with us the masterpieces you create, and a review of the tools you used in the comments section below! Farheen Gani is a freelance writer and content marketer, with a curiosity for all things startup traction. She writes about the best tools for startups, marketing and PR, and major startup ecosystems at StartupBlink. That’s a really nice article Farheen. I have used Canva and Quickmeme . They really help you a lot. 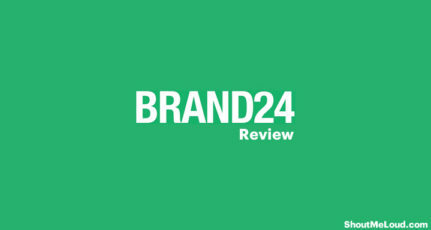 Cava eally help you potray out your information in a creative manner. Will incorporate certain other tools as well. Keep up the good work.! !